Last weekend Matt and I decided to venture downtown San Francisco again. It was a warm and clear day so it was perfect for walking around. After checking out the Union St Festival we decided to head to Pier 39 to look at all the tourists. 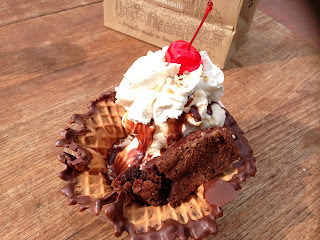 We saw the sea lions and Alcatraz, but it was snack time so we walked down to Ghiaradelli Square to silence our sweet tooth. After window shopping at some stores in the area we headed into the Chocolate Marketplace aka, Chocolate Heaven (can't you just see the angels singing at the top of this picture??). A greeter at the door handed us a free chocolate caramel square and we were sold. They have every different type of chocolate that you could think of so we ended up buying Milk Chocolate Toffee Crunch and Dark Chocolate Cabernet Matinee (infused with blackberry and grape). We also stopped at the ice cream counter and bought a $10 Treasure Island Sundae that had vanilla ice cream, chocolate syrup, and a brownie. 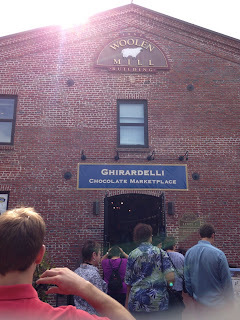 If you didn't know, I'm a huge Ghiradelli fan. I ONLY use Ghiradelli brownie mix so this was the absolute perfect sundae for me. Matt is also a huge chocolate fan so we polished this off pretty quickly. Even though its a pretty popular tourist destination it wasn't too busy on late Saturday afternoon. 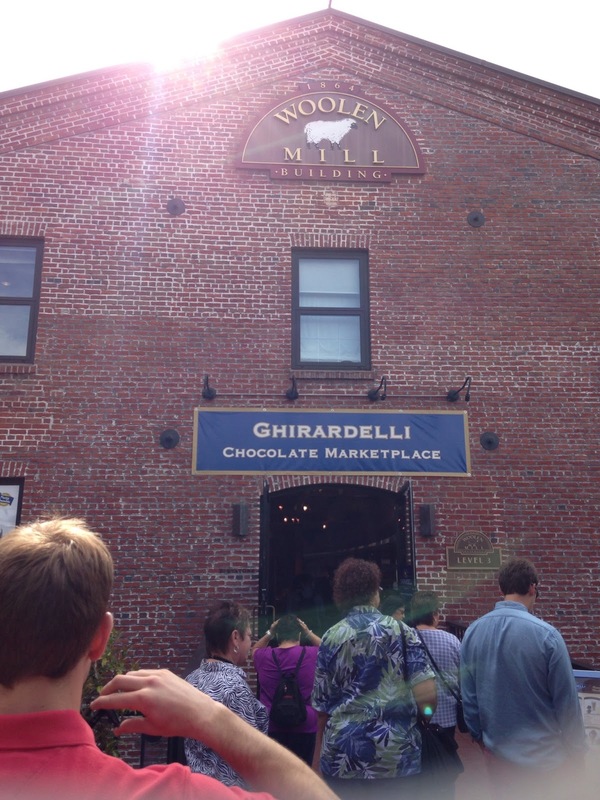 You can't leave San Fran without trying some authentic and super fresh Ghiradelli. My only regret was not buying more!